Bikers, get ready to suit up for your next challenge in the beautiful Land of Enchantment! Head to Santa Fe for a biking event like no other! The Santa Fe Century race features four different rides that take you across New Mexico’s gorgeous landscapes. This May event provides riders with perfect weather on one of the Southwest best bike rides! 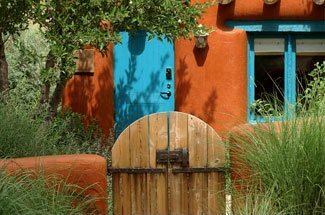 While you’re in Santa Fe, you’ll want to check out the other great attractions, sights, and food. Request our free Travel Guide for an extensive list of all the highlights in and around The City Different. The Century Ride and Gran Fondo run the same 100-mile course. The race begins in Santa Fe and branches south through the Garden of the Gods and then through a couple of old coal mining towns. Then, you’ll hit your first hill up to Stagecoach pass before a nice downhill section. The most challenging part of the course is Heartbreak Hill. Continue to twist and turn through New Mexico’s rolling hills before climbing back to Santa Fe. There are six food and water stations along the way so you can stop and replenish your body before getting back to the race! Tip: The only difference in these races is that the Gran Fondo is chip timed while the Century Ride is not. The Half-Century Ride and Medio Fondo (Medio Fondo is a timed race) are 50-mile portions of the Century Ride. This course takes you souther of Santa Fe and cuts about halfway through to Galisteo, taking you around the Pueblo Canyon and back around to the city. Tip: Make sure you do some training and prepare yourself for this race as you will lose and gain about 2,500 feet of elevation while biking the trail. The 25 Mile Ride allows riders to go out and back on the last 12.5-miles of the Century Ride. This course should only take about a maximum of three hours to complete and only has about half of the elevation gain of the Half-Century Ride. The uphill and downhill portions of this race are very manageable and provide riders with a fun experience. Off-road bikers will love the rugged Rail Trail race. Starting at the Santa Fe Community College, riders will take off down the dirt out and back trail for 10 miles before turning around at Eldorado. This is an excellent race for bikers that want to test their off-roading ability. There are plenty of other events associated with the Santa Fe Century ride that takes place after the race, including beer gardens, massages, and an awards ceremony. An assortment of meals and celebrations make for a fun and engaging May weekend retreat filled with biking, food, and the beautiful city of Santa Fe! Check out the full schedule as well as maps of all the courses on their website! 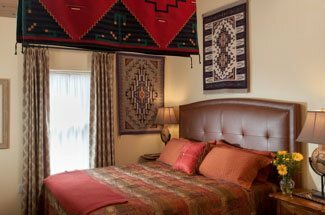 Rest Your Legs at Four Kachinas Inn! Head back to your room at Four Kachinas Inn after a day of biking! Rest in one of our six authentic Southwestern-themed rooms that provide the most comfortable furnishings and amenities for a relaxing stay. 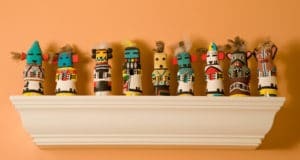 Our Kachina Room is the perfect space to replenish yourself after your long bike ride! It features a King Bed with a sleeper sofa and a private patio where you can enjoy a drink outside during an enchanting New Mexico sunset. Are you riding in the Santa Fe Century race? Check our availability for a stay like no other in The City Different! We look forward to meeting you!